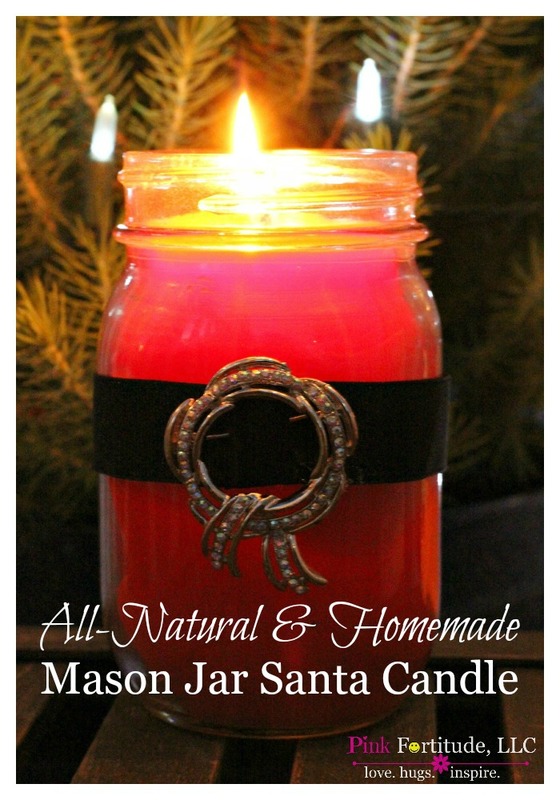 Today my loves, you are getting TWO tutorials – an all in one stop to make an all-natural and homemade mason jar Santa Candle. This was my first foray into homemade candle making. It was fun to try something new, and I’ll take you through it step-by-step so you can make one yourself! 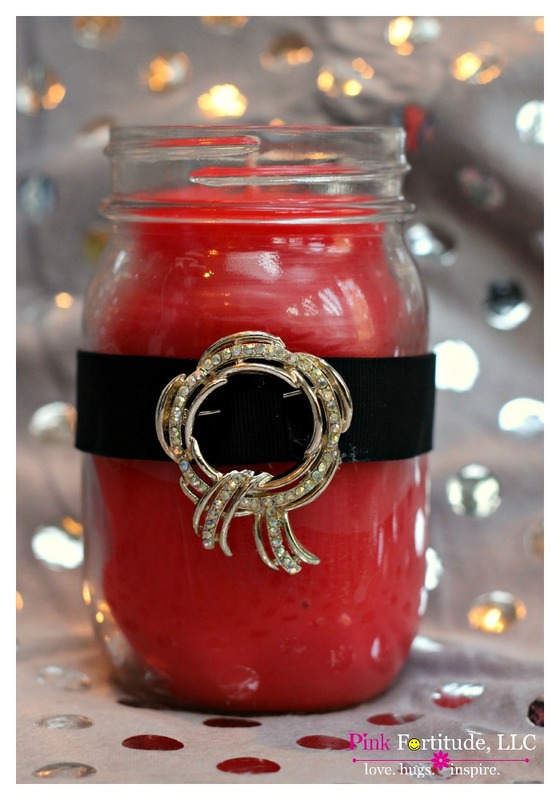 I’ve seen the Santa Mason Jars (no candle) all over Pinterest. TOTES ADORBS! 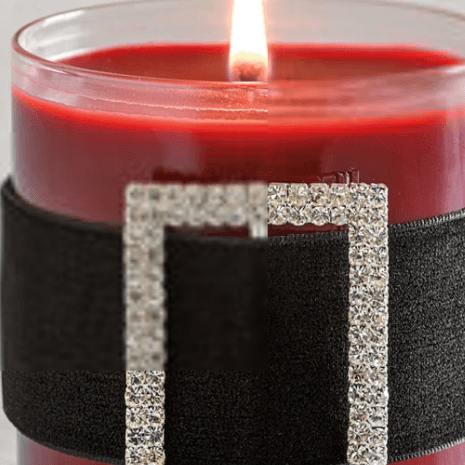 Then one night, I was browsing through a catalog and saw the candle version… being sold for $50.00. Wowza. I spent hours researching homemade candle making. 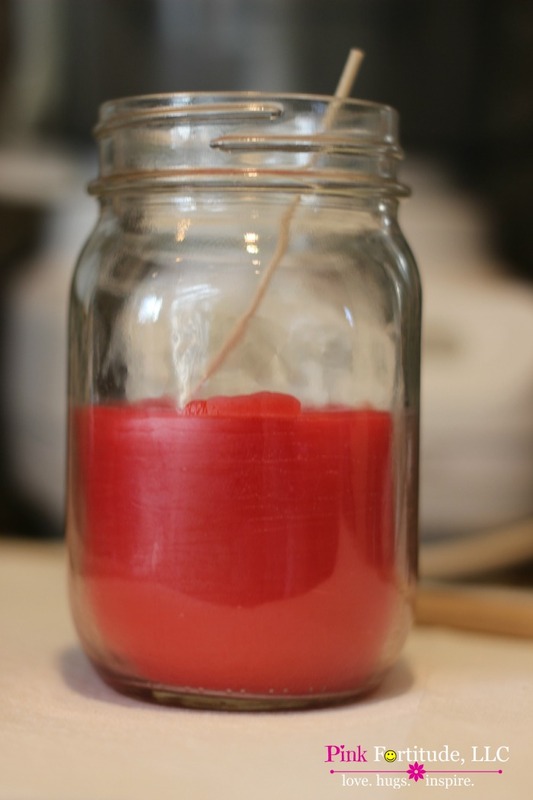 I wanted to learn how to make the most all-natural and toxin-free candle to share with you. There are many different waxes and wicks and dyes that you can use, but they all come with a trade-off. The most common wax is paraffin – it’s cheaper, but it burns as petroleum and leaves soot. Soy candles are increasing in popularity, but the majority of them are made with GMO soybeans. Beeswax is more expensive but burns the cleanest out of the three. I can see my dear vegan readers starting to shake. Sorry, my friends, I am a vegan for health reasons, and beeswax candles are the best ones for me personally! And then there are the wicks – some are coated with the same wax as the candles, some have lead in them… oy vey! 1. 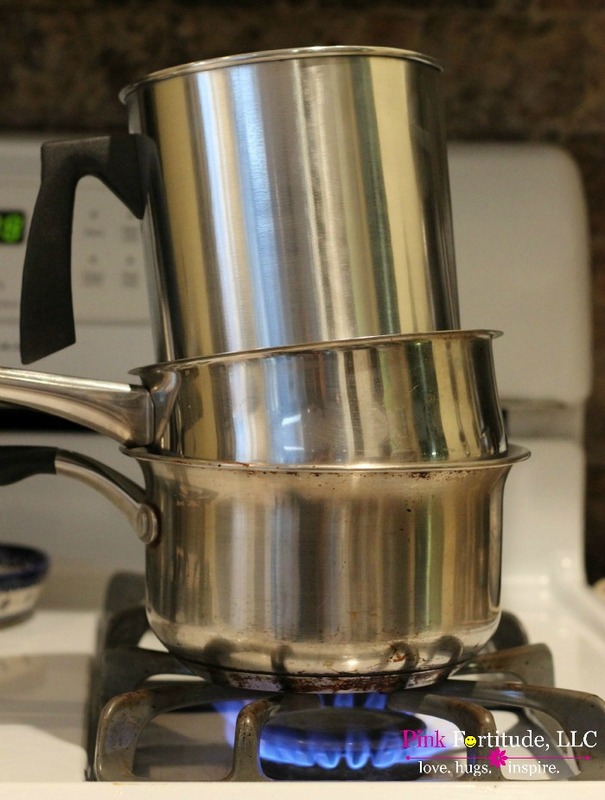 You can use the wax melting pot as a double boiler, but my pans didn’t elevate it enough. So I used it as a triple boiler (water in the bottom pot only) and it worked just fine. Place the wax in the wax melting pot. 2. While your wax is melting, take one of your wicks and give it a dab of hot glue in the bottom center of your container. The wicks I use are stiff, and have the metal piece on the bottom, but some places sell them differently. I like the stiff wicks because they are easier to center. 3. 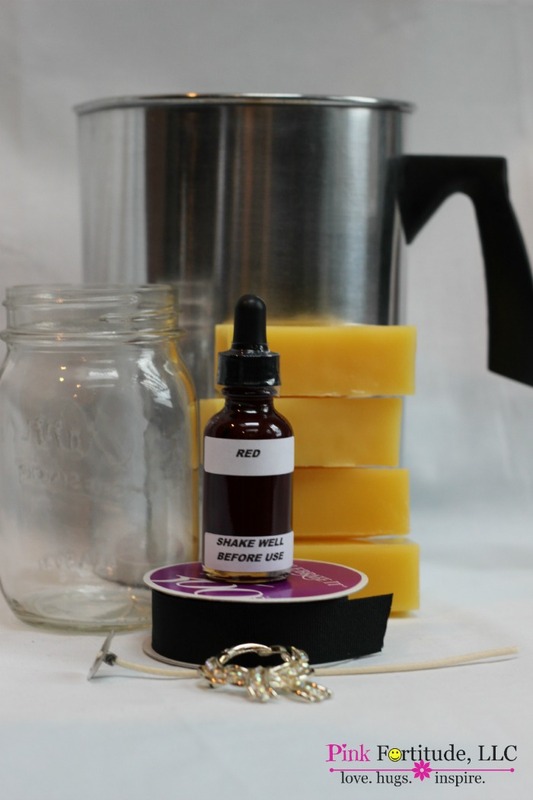 How do you determine how much wax to melt? Size up the bars against the glass container you are using… and then double it. Not that I had to find that out the hard way or anything! I mean… hypothetically speaking of course. 4. Remove from heat once the wax is entirely melted. The “real” candle makers use a thermometer to control the temperature and so they know when it’s properly melted. Um… liquid… I call that a clue. But I’m obviously an amateur. 5. Depending on the size of your jar, drop in approximately 30-50 drops of Cinnamon Essential Oil and stir, and then stir in 3-4 drops of your liquid dye. I was nervous using the red, as I didn’t want it to turn out pink nor RED. So I think it was around 4 drops that I ended up using. I also used the handle of a wooden spoon to stir everything. 6. 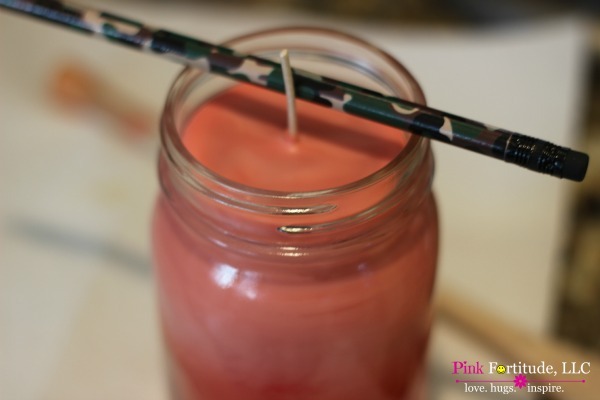 Once your candle wax has filled the Mason Jar or another glass container, you can use a pencil to center it while the wax hardens. 7. I would let it harden overnight before using it, at least a good 12 hours. 8. 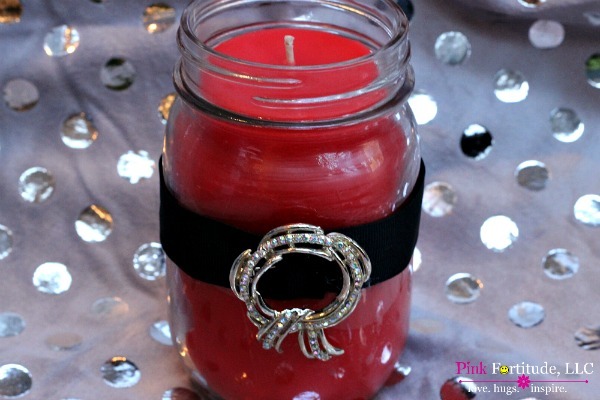 Once the wax has settled, hot glue a piece of black (velvet) ribbon and then pin on a sparkly bauble. You now have a fun Mason Jar Santa candle to use at your own home or to give as a present. So during my research, I learned that wicks have “memories.” So you will want to let the first burn to be at least one hour. 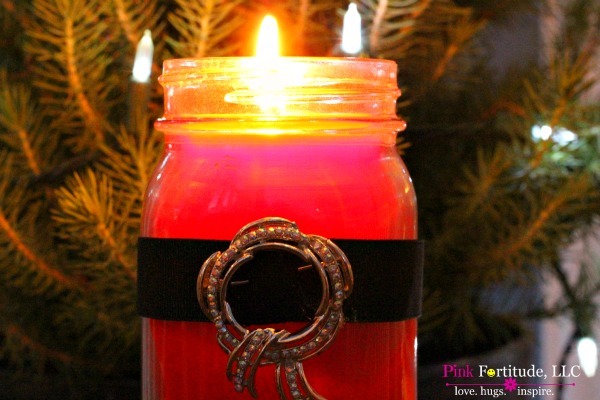 I love the fragrant cinnamon smell… it’s getting me so excited for Christmas!!! Love, hugs, and HO HO Glow! What a fun idea for the holidays! Pinned! Holly, my crafting crazy friend, you hit this one out of the park!! I don’t know if I’m ready to make my own candles (yet), but I adore the way you decorated the jar and I’ll be copying you asap. Thanks for the inspiration, my friend. bulkapothecary.com is a cheaper place to get the Bee’s Wax.